The Space Exhibit is a room found in the Treacherous Mansion in Luigi's Mansion: Dark Moon. The room appears to be a blue room with several astronomy based things including a large display of a moon and two rockets, one having a Gold Greenie in it. To get the ghost out, the player has to go to the Jungle Exhibit for a log, put it on fire in the Ancient Exhibit and then burn the web near the rocket. The Gold Greenie doesn't darken the room when it appears to laugh at Luigi. 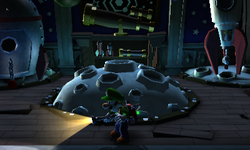 The room also has a telescope which Luigi can see through, they can see the inenterable Moon, but it is required to go to during the third mission to battle the Poltergeist. In addition, there is an E-Gate that allows the player to teleport between rooms. During A Train to Catch, Luigi had to go here after the Strong Poltergeist takes the book required to get to the Train Exhibit off Luigi. The player has to see through the Telescope to see the Poltergeist holding the book. Once the player stops looking at the telescope, they are warped to the Moon, the ghost attempts to throw stars and cherry bombs at Luigi, but is soon captured, making him able to get the book back. This page was last edited on February 28, 2019, at 00:13.